NEWPORT, Ky. – Work on a new highway project is under way, and while it promises to be a boon for the city and motorists, it's causing some anxious moments for Jacqueline Groves, a single mom. Hers is among 150 families forced to move. 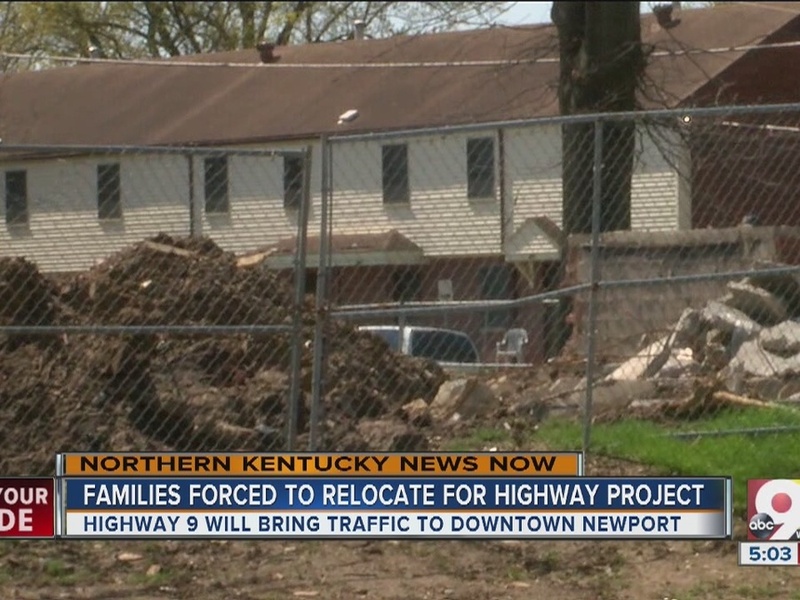 A lot of public housing is being torn down to make room for the new Ky. 9 connector north to Ky. 8 and the Taylor Southgate Bridge. Some buildings have already been demolished, and some families have already moved out. The Newport Housing Authority is providing for them, but Groves is still worried about the future. New Ky. 9 connector features two roundabouts and a 1.5 mile-road along the Licking River. (Southbank Partners). "It leaves us with a combined 'Where are we going to go? Where are we going to raise our kids? How are we going to support it?" It's pretty tough right now," said Groves, a single mom. With a new 1.5-mile road parallel to the Licking River, Ky. 9 will bring traffic right into downtown Newport. "It will connect right over to Newport on the Levee, Third Street, York Street, Monmouth Street so it will provide great connection for motorists coming from the south to get in to downtown Newport," said Rob Hans of the Kentucky Transportation Cabinet. That's not a bad thing, says Groves, who concedes this area has had problems. "The neighborhood is very high drug-related and there's always cops down here," she said. The new project will also include two new roundabouts - at the Veterans Bridge and the Taylor Southgate Bridge, and developers believe that it will give drivers a better choice. "It's a different alternative from using I-75/71, which we all know has heavy traffic almost throughout the entire day," said Hans. With all that change in store, the city, the state and Groves hope it will all be positive. "My goal is to move to Alexandria just because it is nicer. I can feel safer with them out there," Groves said. Groves will get her chance to move starting this September. She and her kids need to be out by the end of the year. The two-year project is expected to last through the 2017 construction season.